Who knew that Ally Condie had the thirst for revenge in her? Prepare to see a new side of her writing in The Last Voyage of Poe Blythe! In a desolate landscape, Poe Blythe has seen the worst of humanity. On her first gold mining mission for her home settlement, known as The Outpost, raiders stole the ship and murdered the most important person in her life, Call. Two years later, Poe is captaining an expedition for the first time. She has developed a vicious technology that has killed many a raider as they attempted to board the ship in past missions, but Poe has a complication this time around: There’s a traitor in league with the raiders on board. Poe is determined to keep her revenge mission running smoothly, and that means that no matter what happens and no matter how bad things get, she can’t trust anyone. Ally Condie is a very successful author, but I questioned whether she could really dive into Poe’s angrier side. In general, her previous books have been a little… well… softer. Could she really pin down that fury? The answer is yes, but definitely in her own way. Poe’s grief and isolation in the years since Call’s death feel genuine, as does her ache for retribution. Unlike Condie’s past characters, Poe isn’t an inherently good person. She’s (tangentially) responsible for many deaths and wants even more people to die. That said, the character is not a ruthless assassin type who’s just running around killing people, either. There’s no brutal death or violence on the page, but it’s in the periphery. Poe is boosted by a strong secondary cast including her first mate Brig, a loyal follower of The Outpost’s corrupt leader, The Admiral; her second mate Naomi, who was with Poe on the devastating journey during which Call was killed; Eira, a young mapmaker and artist with dreams beyond The Outpost, and Tam, a young cook with a heart of gold. Her inability to trust any of them doesn’t stop their personalities from shining through, even as you question their every move. Along the journey, we also meet some raiders who play a very enticing role in the story, but I won’t say too much about them. Condie introduces a very current theme in this novel: The duality of human corruption. Conflict is not neatly broken up into heroes and villains. Everyone has their reasons and everyone believes they’re doing the right thing. Poe’s position in all of this is unique because she’s not playing sides– She’s on no one’s team but her own. Despite preconceived notions, she makes a point of carefully analyzing the world around her and from there, all she can do is what she genuinely believes will be best. It makes her an unpredictable curiosity of a character, but it serves the theme very well. If there’s one complaint I have about the novel, it’s the world building. It seems like Poe’s world is a distant future America, but it’s never established outright. The logistics of where the characters are from and where they’re going remains pretty vague throughout and while that may have been intentional, I wanted to know more. It didn’t distract from the storytelling outright, but it would have been great to sink into it. My affection for the Matched series aside, The Last Voyage of Poe Blythe is Condie’s strongest work to date. It feels more in-depth and more mature than her previous works while offering up a dose of steampunk, creating an end result that stands out among the massive selection of YA novels out there. Give this one a whirl! We think you’ll be surprised. 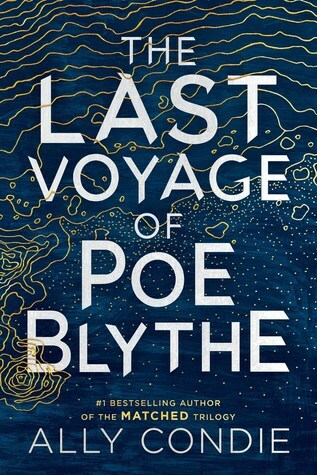 The Last Voyage of Poe Blythe is out now. You can snag a copy via Amazon or support your local independent bookstore via Indiebound!